up to 50% of all the antibiotics prescribed for people are either not needed or are not optimally effective when prescribed. drug resistant bacteria cause 23,000 deaths in the United States each year. I’m also sure that Friday September 28th this year had no particular significance for most of us— except for it being another TGIF. This date, though, was the 2nd annual ‘National Penicillin Allergy Day’—promoted by the CDC and multiple medical professional and commercial organizations. The date was chosen because September 28th 1928 was when Alexander Fleming discovered penicillin. 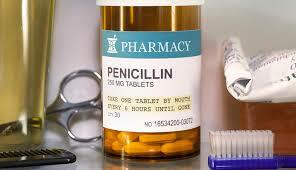 However, penicillin was not used for a substantial number of people until the late 1930s/early 1940s. Ten percent of patients in the United States report penicillin allergy, which is the most commonly reported drug allergy. But, 9 out of 10 patients who report penicillin allergy are not truly allergic when assessed by skin testing. More than half of patients who are skin-test positive lose their sensitivity by 5 years. And 80% of them lose their sensitivity by 10 years. Factors that account for penicillin allergy actually being absent include the following: viruses and bacteria that created the infection can cause rashes; another drug or product used at the same time was the actual cause; an entirely different medical condition was the cause depending on the type of symptoms and the physical findings; some reactions that occurred to patients over 70 years ago were due to impure preparations of the penicillin powder. So, if someone can be shown not to be allergic to penicillin, that person benefits from having the option to use a penicillin-type of antibiotic that is the first-line treatment for certain infections and that is typically less expensive than other antibiotics. The health care system benefits because, otherwise, patients with unconfirmed penicillin allergy have been shown to spend more time in hospitals. Everyone else who is not penicillin allergic benefits by having less drug-resistant bacteria that could be acquired in the community or in a hospital. If the penicillin-associated symptoms were (a) either a mild rash or gastrointestinal symptoms or headaches and (b) were more than 12 months ago along with (c) a concern about taking a test dose of the penicillin antibiotic without doing skin testing first. The discovery of antibiotics is one of the great successes in mankind’s search for a longer life without pain and suffering. However, with great discoveries come great responsibilities for their uses, as we’ve seen since the nuclear age began in the 1940s. Bacteria and viruses can mutate or adapt to changes in the environment. We all need to adapt as well in our use of medical advances such as antibiotics when the scientific facts justify it–so that we make this world a better place for us and for those around us.